Quick Cooking Tip – Parsley! Here’s a little tip for getting the most out of your cooking time, especially in the summer when most of us would really like to create fast, bright, nutrition-packed dishes without using a lot of heat. This is the stuff that nearly every restaurant uses for a garnish on your plate. You know, the little green sprig of greens on a tiny stem that add color to the otherwise medium-dull plate of food. I had never thought of parsley as a vegetable, as in—something you actually eat—until I met my friend Carolyn years ago and went to her house for lunch. She served parsley sandwiches! She used some homemade whole-grain bread with a bit of mayo, sliced tomatoes from her garden, a few slices of red onion and a huge bunch of parsley. This turned out to be a delightful sandwich! I have indulged in parsley sandwiches ever since. 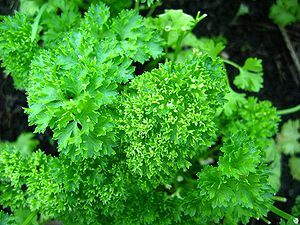 I happen to prefer the “Italian” parsley which is the flat-leafed variety. And yes, if you do eat the little sprig served as a garnish, chlorophyll-rich parsley will help you cleanse your breath. Parsley is often eaten raw but it can also be added to cooked dishes. Parsley can be washed, cut and dropped into a dish you are cooking and will rapidly turn bright green. When it is bright, it is done. This delicate culinary herb takes almost no cooking at all yet it has powerful nutritional properties. Usually I add parsley to a dish I’m cooking and turn off the stove. Gorgeous! If you want to, you can wash an entire bunch of parsley by filling your sink or a bowl full of cold water and immersing the entire bunch still tied together. Shake it around and get all the sand and dirt out, then drain the bunch and untie it. That way you will not be chasing around small sprigs of the stuff in your wash bowl. This entry was posted in Cooking, Food, Health and tagged culinary herbs, curly parsley, Italian parsley, nutrition, Parsley, sandwiches, summer cooking, Vitamin K by mycookinglifebypatty. Bookmark the permalink. The flat leaf variety is *so* much more flavorful, isn’t it? Mmmm, parsley! We didn’t grow any this year, though. Instead, we are eating cilantro like it’s the new parsley–in everything. thanks for reminding me that I can buy parsley again! I’ve been a parsley fiend since I wrote this one! I liked parsley in the sausage dish you made… very fresh tasting and gave it a freshness.